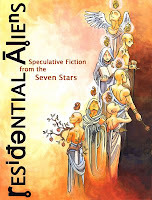 Announcing the debut issue of a speculative fiction ezine with a spiritual foundation. Although once deemed a "lost genre," stories with a fantastic element are making a comeback. This new online publication is simply another venue for writers, readers, and artists of the fantasy, sci-fi, and supernatural genres to share and enjoy their stories. Please spread the word about Residential Aliens. Your comments and links are also welcome. PS I am accepting submissions for Issue #2 to go online August 1. For guidelines visit RA. For questions or comments, email me at lyn @ rightthinking . net.